This 35th Annual National Conference is the largest Health Information Management event in the industry and the only one that showcases the industry’s key issues in the one setting. 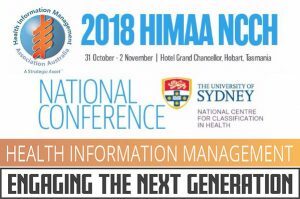 HIMAA teams up with NCCH to double the informational and learning power of the networking event of the year for HIMs, Clinical Coders and other professionals associated with the management and use of health information. The theme for this year’s conference “Health Information Management: Engaging the Next Generation” will see healthcare professionals explore eHealth, funding, service management, medico legal issues, human resources and change management, research, international perspectives, and workforce pathways.